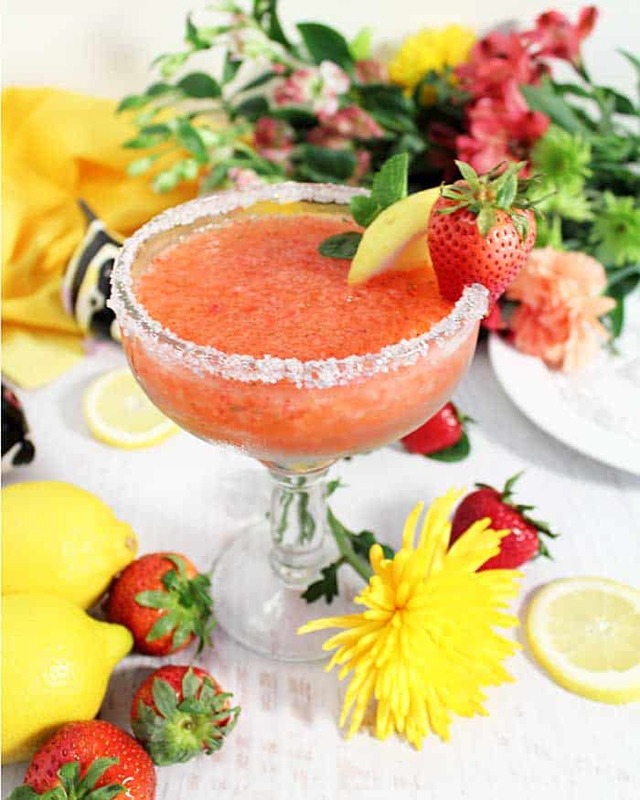 Strawberry Lemonade Margaritas are a refreshing summer take on your standard margarita. 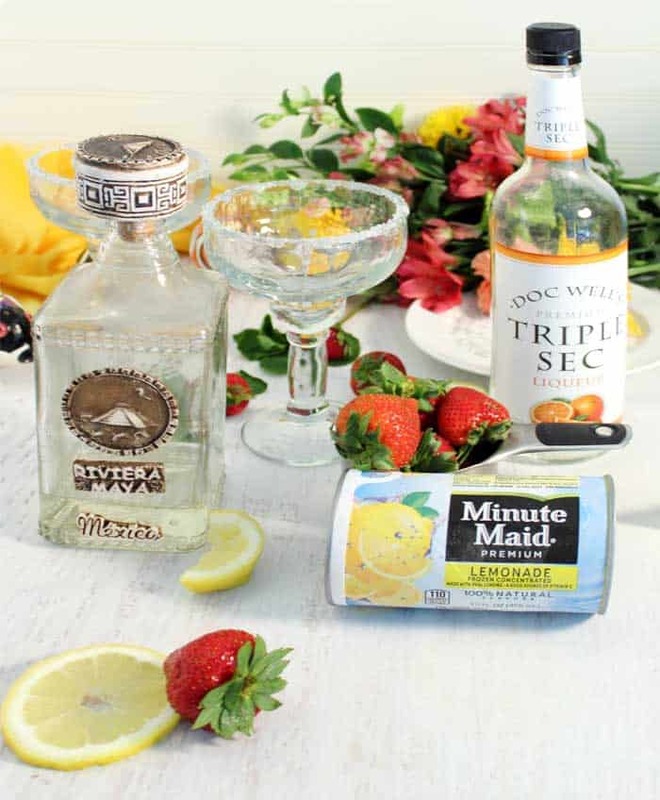 They combine all the flavors of summertime, tart lemons and sweet, juicy strawberries with the always popular margarita for a quick and easy adult cocktail. 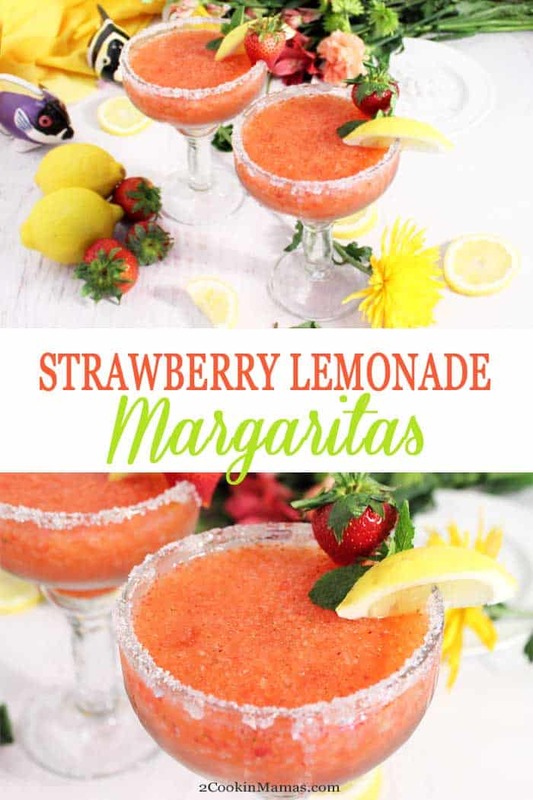 Lemonade is the perfect refreshing drink for summer but these deliciously fresh and bright Strawberry Lemonade Margaritas are even better! 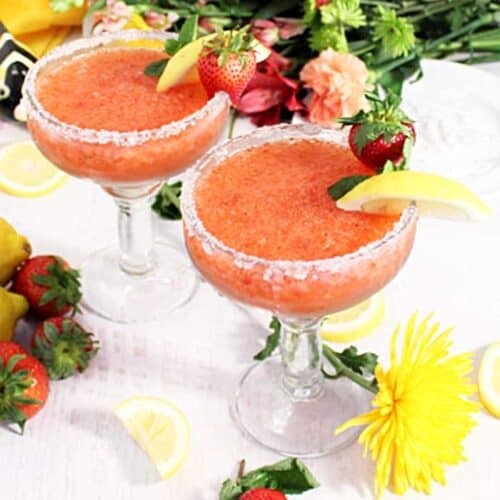 Anyone that likes margaritas, especially strawberry margaritas, will love this version. They’re so easy to make too! All you do is combine a little frozen concentrated lemonade with fresh strawberries, a little mint and the usual tequila and triple sec. This drink is more sweet than tart so the rim of the glasses are coated with coarse sugar instead of salt. I also added some silver decorating sugar just to give it a little more pizazz! Doesn’t it look pretty? 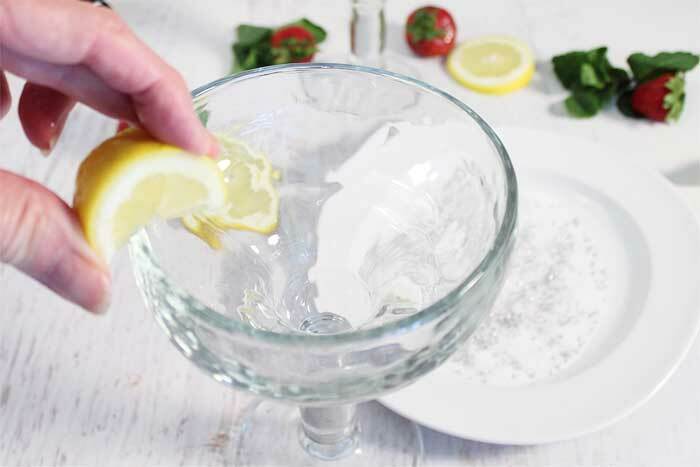 Now check out just how easy this summery cocktail is to make. 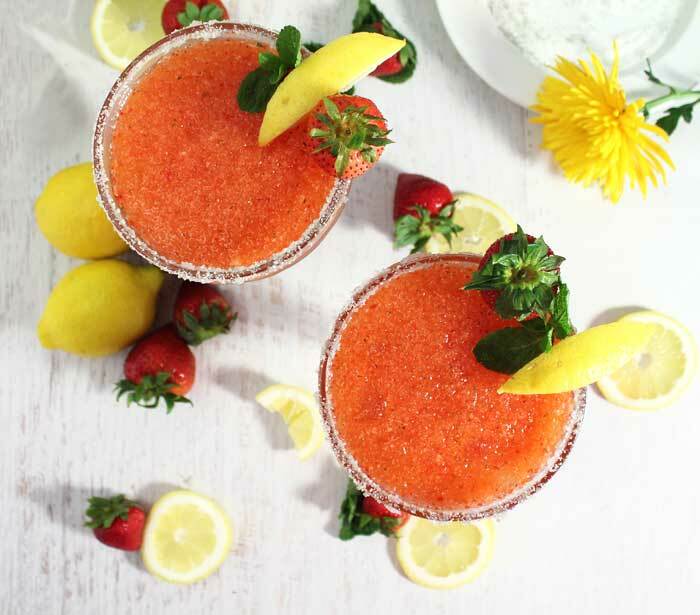 Gather the ingredients to make these strawberry lemonade margaritas. 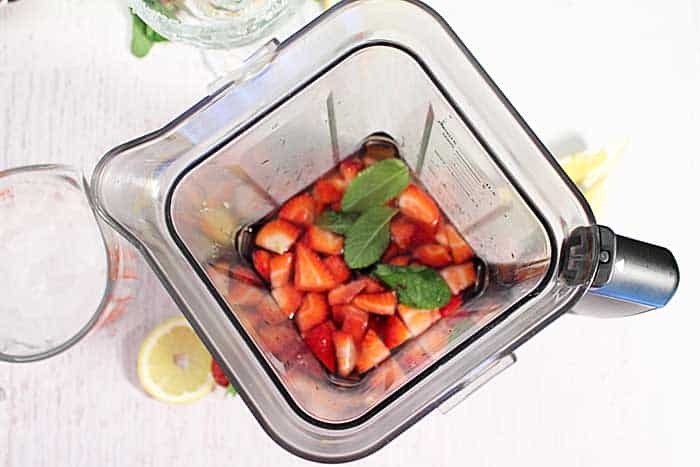 You’ll need lemonade concentrate, tequila, triple sec, strawberries, mint sprigs and a few lemon wedges. 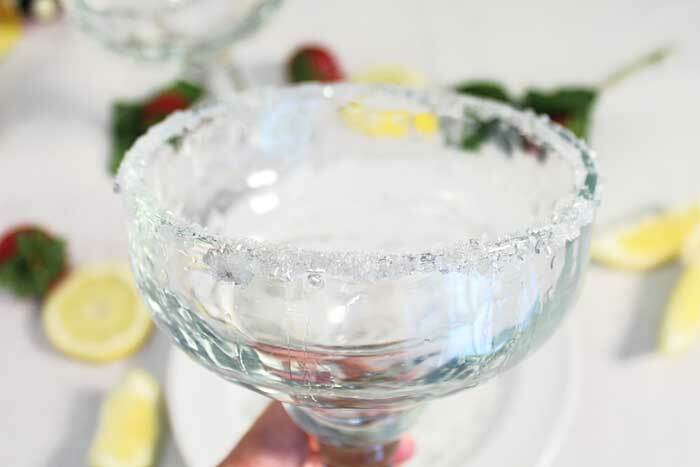 Rub the rim of the margarita glass with a lemon wedge. Dip the rim into a plate that has been filled with some coarse sugar. Love fruity, summery cocktails? Then you might want to check out these popular drinks too. Watermelon Sangria, Island Breeze and Strawberry Rum Fizz. 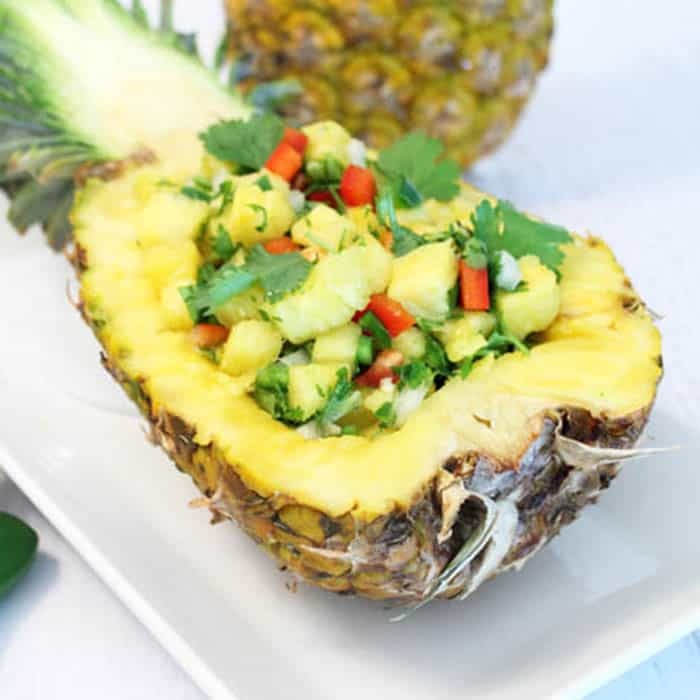 In blender, combine all ingredients except garnish. Add ice as needed to make slushy consistency. 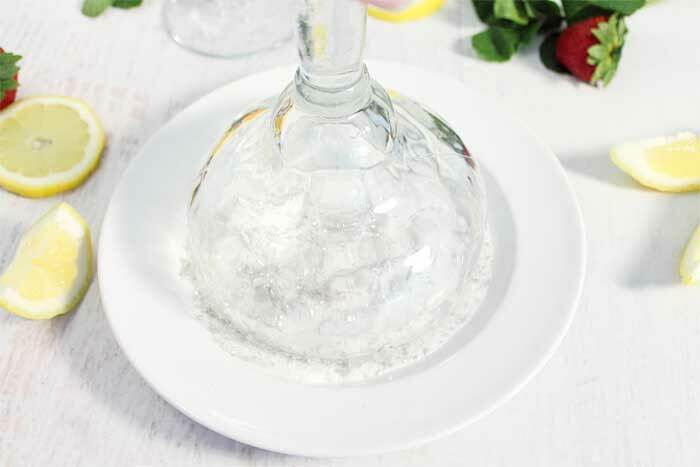 Wet the lip of margarita glasses with a lemon wedge and dip in sugar. Divide mixture between glasses and garnish with lemon slice and sprig of mint. 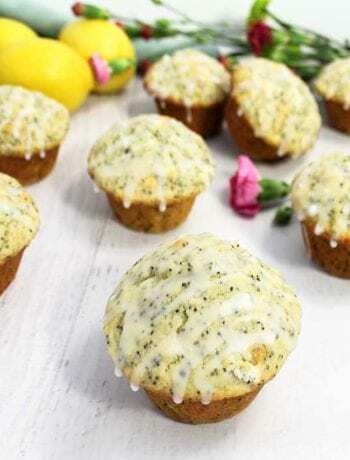 Lemon Simple Syrup: Combine 1 cup sugar, 1 cup water and juice of 1 lemon in saucepan. Heat to boiling then simmer until sugar has dissolved. Let cool and store in sealed jar in refrigerator. All photos and content have been updated from the original post which was first published on August 19, 2014. 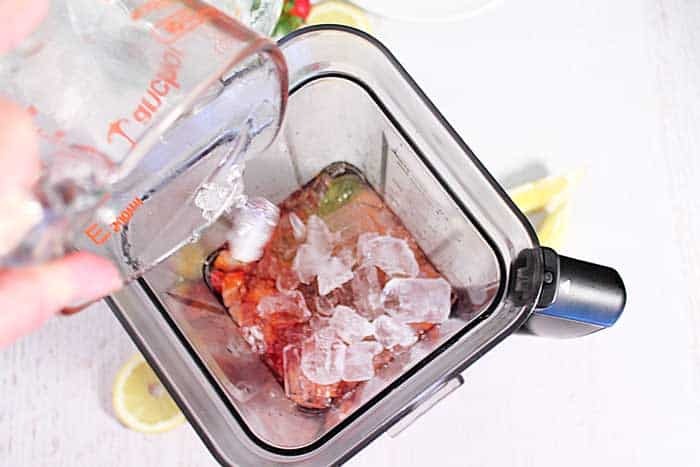 I love strawberry lemonade but haven’t ever tried making my own, need to give this recipe a go! It’s really easy to make. If you love strawberry lemonade you’ll love this cocktail. I’m really loving the ingredients in this margarita — so simple to make — this would be great with my favorite guacamole! 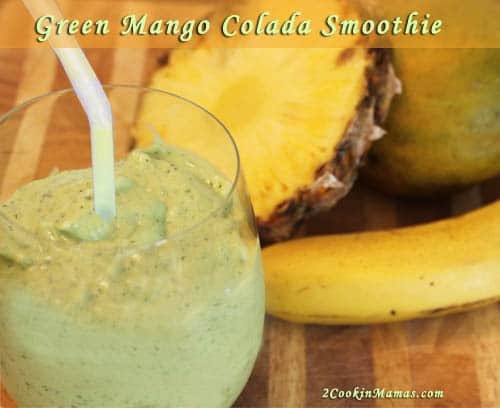 It would be fantastic with your favorite guacamole! I mean, margaritas and guacamole just go together! Such a refreshing cocktail to enjoy in summertime — I love the strawberry lemonade flavor combo.